This is a medium-sized owl with short, inconspicuous ear tufts, black eye sockets, and yellow eyes. The underside of the wing has a dark “wrist” crescent and black wing tips. It hunts during the day, flying low over grasslands. The wingbeats are long and slow. 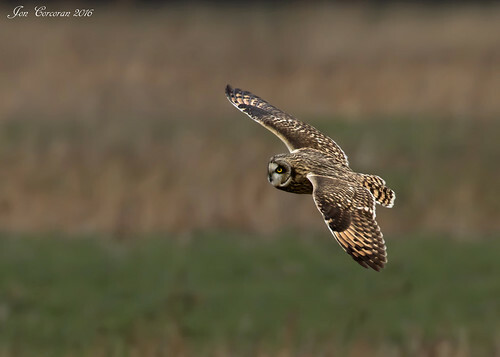 This short film by owl conservationist Ian McGuire takes a brief look at the nomadic owl that is active during the day - the short-eared owl. As difficult species go, the Long and Short-eared Owl pairing are amongst the most challenging to identify, especially in flight. The latest identification video from the BTO offers tips on how to separate both, in flight, perched and by calls. 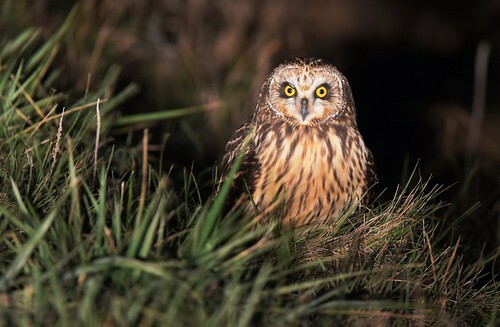 Asio flammeus, the Short-eared Owl, is a medium-sized owl averaging 3443 cm (13 to 17 inches) in length and weighing 206475 grams (11 to 13 ounces). It has large eyes, big head, short neck, and broad wings. Its bill is short, strong, hooked and black. Its plumage is mottled tawny to brown with a barred tail and wings. The upper breast is significantly streaked (Alsop 2001). Wingspans range from 85 to 103 cm (38 to 44 inches). Females are slightly larger than males. The yellow-orange eyes of A. flammeus are exaggerated by black rings encircling each eye, and large, whitish disks of plumage surrounding the eyes like a mask. The Short-eared Owl occurs on all continents except Antarctica and Australia; thus it has one of the largest distributions of any bird. A. flammeus breeds in Europe, Asia, North and South America, the Caribbean, Hawaii and the Galápagos Islands. It is partially migratory, moving south in winter from the northern parts of its range. 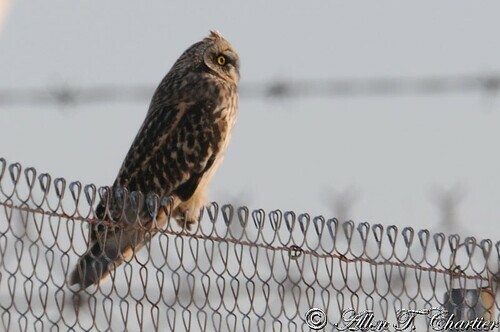 An evening with a Short Eared Owl at Stanwood, Washington.